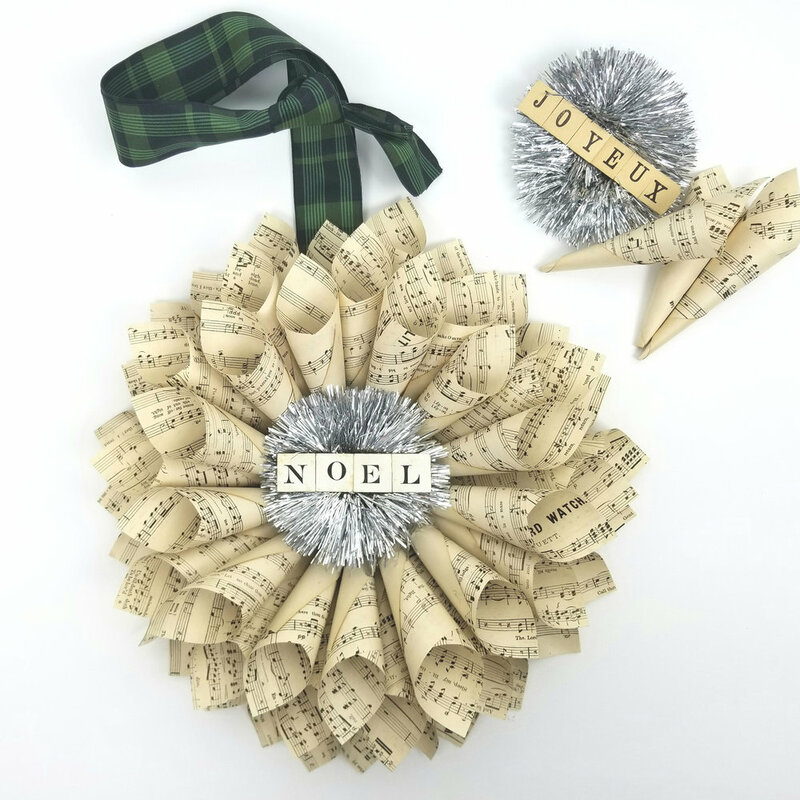 You will need: 8” square of cardboard, sheet music or old book pages cut in 52 pieces measuring 4” x 6”each, 52” to 54” piece of ribbon, tinsel, letters, glue gun. Make sure the paper isn’t to brittle because it will be hard to work with. Cover the cardboard on one side with whatever paper you decide to use and cut a slice in the corner to slide the ribbon through. The size of the ribbon will determine how big a slice. It is important to put the ribbon in now as you won’t be able to when the wreath is finished. This ribbon was from the Hearth and Hand collection from last Christmas. Turn over and draw a circle (this is about 2.5”) in the center as a guide. Make your 4 x 6 pieces into cone shapes and glue with glue gun. Start gluing to the cardboard using the circle as a guide. The bigger the circle the more cones you will need but for this one this is what I used. You need to glue 26 cones in the first layer. If you find that you need a few more remember that the first layer has to be an even number. Continue all the way around. It will look like this. The next layer will be 13 cones and you will glue them in between the cones on the first layer skipping every other one. The tips of the cones on this layer will go a little further into the inner circle causing them to be a little shorter than the first layer. It will look like this. The third and last layer you will fill in the gaps between the cones on the second layer with another 13 cones. When you apply the glue on the this layer you may have to add to the sides of the cones so they stick to the under layer well. After adding the third row it will look like this. You can fill in the center with whatever suits you but I had some vintage tinsel that I rolled into a circle and glued to a small piece of cardboard then glued it to the center. The letters I used are vintage Anagram letters but Scrabble letters would word or you could make your own. I cut a small piece of cardboard and added the letters to it then glued it to the tinsel. The finished product looks like this. They make really nice gifts. Someone once gave me a stack of sheet music that belonged to their parents. Their parents had passed away and she asked me to make 6 wreaths to give to her siblings. Such a nice gift. When you have lots and lots of paper and glue you look for new ways to use it up. I started making these a few years ago and I thought maybe my fellow paper hoarders might like to see my process and possibly make a few. It is kind of messy but the end result is pretty. I like a little sparkle around the holidays but if that’s not your thing you can skip the fine glitter. A plastic Christmas ornament with a removable top. These are 2.65” but get the size that you like. Old book pages (or whatever paper you would like to use) cut into strips. Mine were about 3/4” and 1/2”. 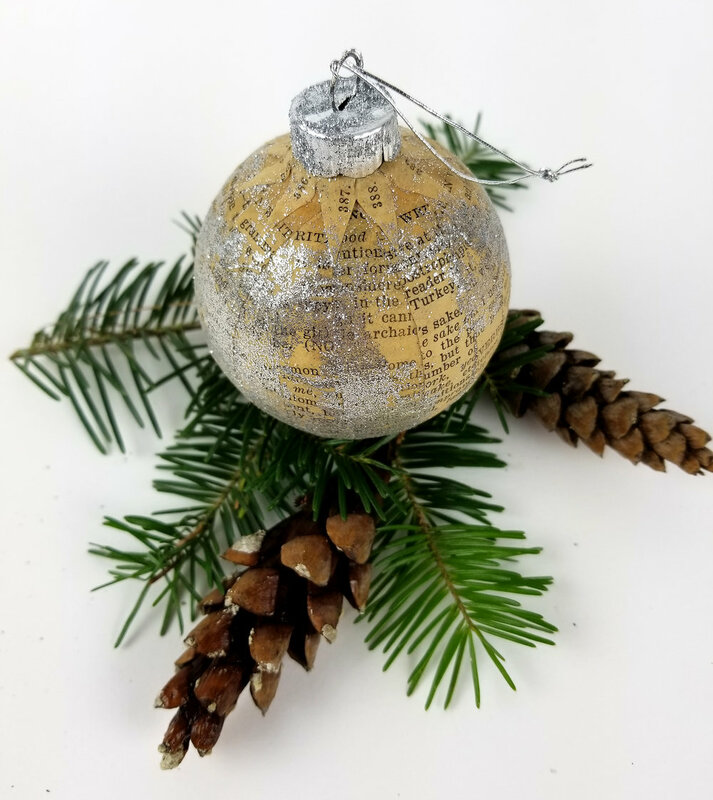 Make sure the paper isn’t to stiff because it won’t mold around the ornament. Cover a generous area with matte medium and place four of the larger strips around the ball. Apply matte medium over the top as well. Then continue around the ball with the smaller strips to fill in the spaces. Smooth the paper out as you go. It will be wrinkly at first but the more you work it the smoother it will get. Once the ball is covered, and still damp, use your hands to smooth out the bubbles and make sure the paper is lying flat. I make a paper cuff to cover the ends of the paper at the top. You don’t have to add this but I think it looks nice. If you cut the “V” deep it will go around without tearing. Again, apply the matte medium first then on top. One thing is for sure..I will never be a hand model! Almost done now…while the ornament is damp you can sprinkle a little glitter or roll it in a dish of glitter. I also put some glue on the top and put glitter on that and pop it back into the ornament. Now add your string or ribbon and it’s done. You can certainly embellish as much or as little as you want. "Learn from the past, set vivid, detailed goals for the future, and live in the only moment of time over which you have any control: now." Denis Whartley. Been quiet here for some time now. I guess I've been struggling with what I want my blog to be and I think that my interests seem to jump around to much...so I've decided to make some changes this year and really focus on my photography and share only that on this blog. I decided to join a 52 week project which I have never done before. There is a theme each week but you don't have to stick to it if you don't want to. The first was "Fresh". The usual things came to mind like fresh eggs, fresh flowers, fresh veggies...but what I chose was a picture of our new kitten, Howie. We adopted him for Christmas and while playing around with my lensbaby I took this picture of him and thought that I would use this photograph since we gave him a "fresh" start. So there you have it. You can check out the website here if you would like more info on the 52 week project. Another change for me will be focusing on black and white photography. Many moons ago I only did black and white and over time I started adding more color. My love is really black and white and I miss it so I will be trying to create more images void of color. I will be sharing the 52 week images here as well as others so I hope you enjoy what you see. 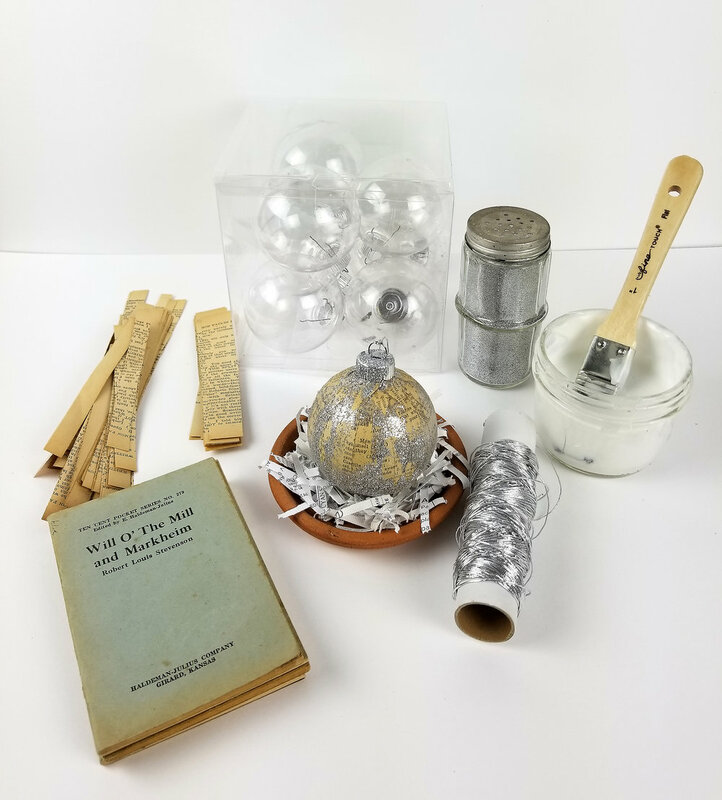 I have been getting ready for the holiday season making these wreaths out of vintage materials. 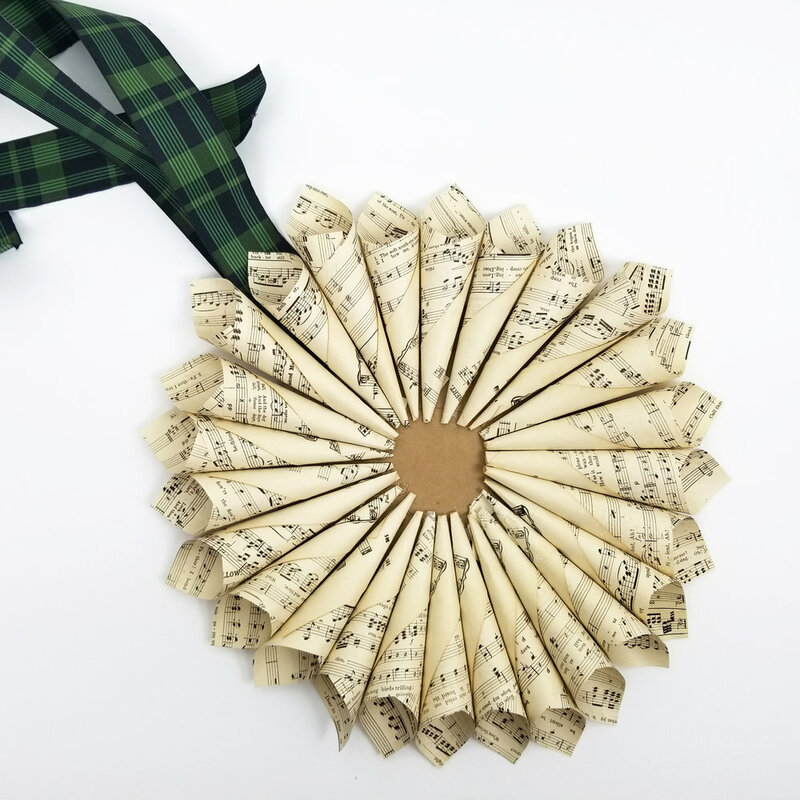 I have seen many versions of the paper wreaths out of sheet music and after some fine tuning I have come up with my own version. I search for old sheet music so the paper has an aged look. It can't be to old or it falls apart when I fold it. I also use vintage tinsel garland that I look for at estate sales or on Ebay. Some tinsel is older than others so each wreath can vary depending what I can find. Then I use letters from vintage Anagram games. Again some letters have been used more than others but I don't use any that are really worn or stained. The ribbon is a natural jute ribbon. Lastly they are packed in a cello bag to protect them. I really like the neutral color pallet and a little bit of sparkle from the tinsel and fine glitter on the medallion in the center. These are for sale here. I was able to snag a few of the last cottage roses of the summer for these photographs. The color is such a beautiful magenta and the afternoon light was so warm...a perfect combination. I've started to use manual focus when setting a shot like this. I was having some trouble with the auto focus and was so much happier doing it myself. The lazy hazy days of summer... When I was a kid summer seemed like the longest stretch of time to me. It seemed n-e-v-e-r ending...not so much anymore. Now it seems to get shorter and go faster than I ever expected. So if you are like me and it seems to fly by I hope that you can take some time to float in a pink inner tube, read under a striped beach umbrella, feel the breeze of the fan on your face, hear the sounds of the waves washing on the shore, swim in a crystal clear lake, kayak on whatever body of water you like, and eat lots of summer produce from the farmer's market. I have been steadily working on updating my Etsy shops, my facebook page, my blog and I think that's it. I'm tired of looking at the same old thing and I'm guessing that people that check in now and then are tired of the same as well. I've been spending most of my time on my vintage shop adding new things for the past week. Here are a few items with an aqua theme going on. It has been a looooong winter and I'm feeling the tag sale itch coming on so here's to spring and the hunt for treasures. It has been so cold the past few days that the thought of shooting outside is not very appealing but I enjoy shooting inside and looking for the beauty in ordinary objects. I took these using my Lensbaby. I love the selective focus and of course the light was perfect. I also enjoy flowers in black and white. Taking away the color and just having the graceful lines is so inspiring. I'm looking forward to warmer days but I'm thinking I may be indoors for a while longer. Beautiful morning light on my coffee table.